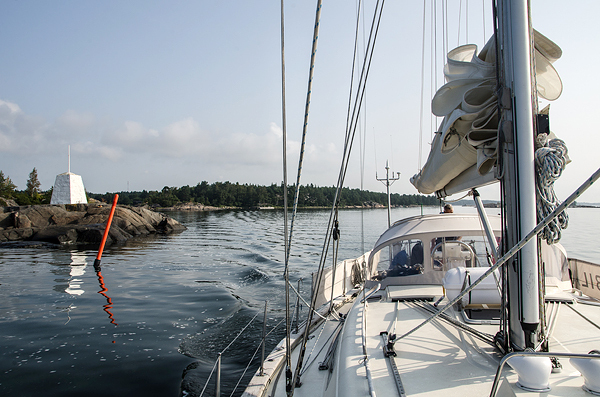 ARC Baltic experience, interview with Tina and Richard Exley - Sail in Finland! 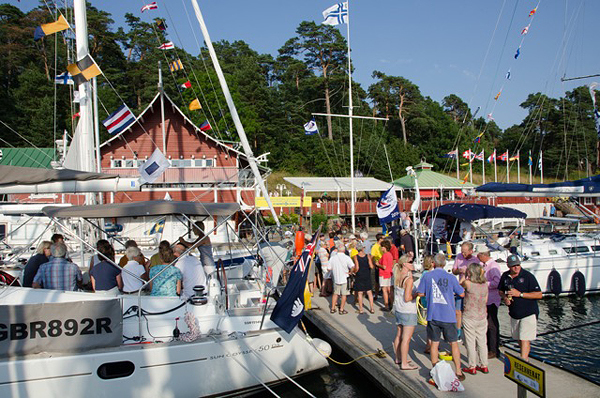 The World Crusing Club (of Atlantic Rally for Cruisers, ARC, fame) organized their first Baltic rally in August 2014. I had the pleasure of joining the rally for a couple of days as the fleet made its way from Helsinki to Mariehamn (see my account of the trip here). I sailed with Tina and Richard Exley from the UK onboard Jubilare, their very nice Rustler 42. Back in the UK and with Jubilare safely up on land, Tina and Richard had some time to reflect back on their ARC Baltic experience. Here is what they thought of their trip. Sail in Finland (SiF): Tell me a little about your sailing background? 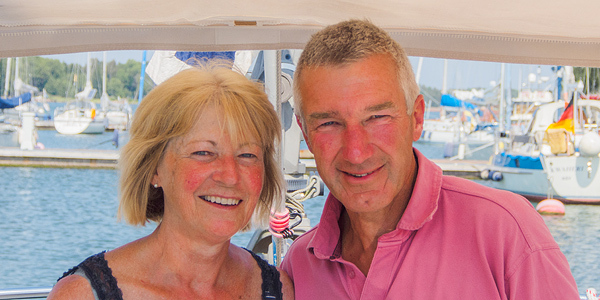 Tina & Richard Exley (T&R): We both enjoyed being on the water in our childhoods, Tina was born in Barbados and spent lot’s of time on her father’s deep sea fishing boats whereas I born in North Yorkshire and had to content myself with a sailing dinghy on the local lake. Later in life when we met, married and had children it was a windsurfer that got us out on the water but as our children grew and left home we ended up taking our first flotilla sailing holiday in the Greek Islands. That really ignited our passion for cruising and in 2005 we bought our first boat. Largely self taught we spent many happy times cruising to the Channel Islands and the north coast of France. The ARC Baltic fleet was hosted by Nyländska Jaktklubben at their marina in the center of Helsinki. SiF: What tickled your interest to join the ARC fleet to the Baltics? What kind of expectations did you have? T&R: In 2012 we retired from our busy working environment and managed to buy Jubilare a 2001 Rustler 42.We set our sights on expanding our cruising range and when we read in a yachting magazine about the new ARC Baltic it ignited our interest. Being able to achieve the trip in stages meant we could manage as a couple and yet move our sailing experience up another notch. SiF: And how did the Baltic tour meet those expectations? T&R: We had a fantastic time, being able to visit all the great cities of the Baltic gave us a real sense of achievement. We made many friends during our time together, a total of 27 boats from all over Europe took part so the social aspect was excellent. I think also it was helped by the Baltic having it’s best summer for decades! 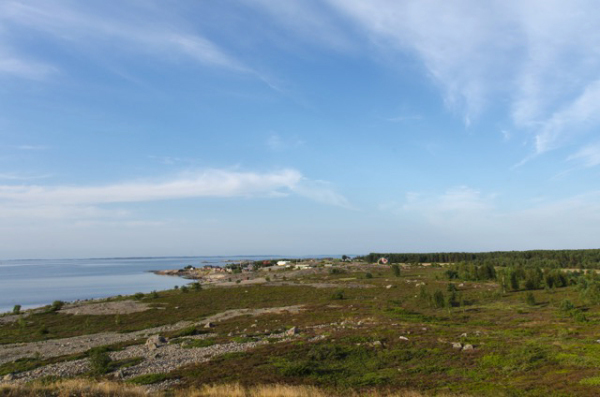 The island of Jurmo offered some rugged scenery as well as friendly locals. SiF: In your view, what were the highlights of the tour? T&R: To us the whole experience was brilliant, every day was different a new city to visit or a passage to plan and execute together with sailing through the most beautiful scenery. Some of the highlights were getting to and visiting the sights of St Petersburg, that was the farthest east we sailed and after that we started to travel west again. 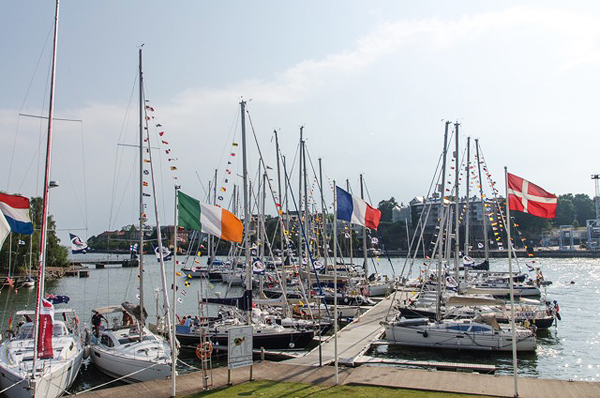 Mooring at the beautiful NJK Yacht club in Helsinki in glorious sunshine and enjoying a fantastic meal with all our fellow rally participants in the clubhouse was another lasting memory. Sailor party on the docks in Mariehamn. SiF: You didn’t have too many days in Finland, but what was your overall impression of Finland? 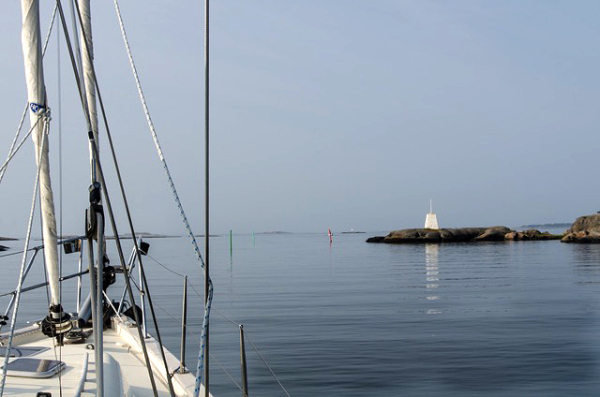 T&R: Perhaps we were biased as we sailed through the Finnish Archipelago in glorious weather, but the challenge of navigating the many narrow passages through the islands coupled with the beautiful scenery made for a complete sailing experience. We were very impressed withe the Baltic cities and Helsinki was no exception, a great atmosphere and lot’s of great cafes which we enjoyed sampling! We stopped off at the small island of Jurmo and saw the real Finland, a beautiful place exposed to the full force of the Baltic with such natural beauty. SiF: You sail Jubilare, a Rustler 42, which has been mainly designed for bigger waters than the Finnish archipelago, how did Jubilare manage in the Baltic waters? T&R: As you say she is built for long distance cruising and certainly on some of the later passages when the weather turned she came into her own. For the close quarter sailing in the archipelagos she was not the ideal, we found the lack of a self tacking foresail when just two up quite a disadvantage.We managed to sail quite a bit of the way particularly when the waters opened up but a lot of the time it meant sails down and engine on! Jubilare, a Rustler 42, safely navigating even the most narrow spots along the route. SiF: Now, with your experience, what would be your recommendations to people in the UK and elsewhere dreaming about a sail in the Baltic? T&R: The Baltic is a great sailing area with so many places to visit and all possible in short passages of a day or two. From the UK it is also feasible to get to the Baltic in short hops and weather permitting can be done in a week or ten days taking it very easy. Certainly make sure you have up to date charts, we in the UK are often used to deep water sailing however the Baltic has specific channels in the archipelagos which need to be followed exactly using the excellent buoyage. Approaching the narrowest passage of the trip. One joy is there are no tides so those early hours of the morning departures to catch the tide can be forgotten also many of the areas have shelter from surrounding islands giving relatively calm seas. 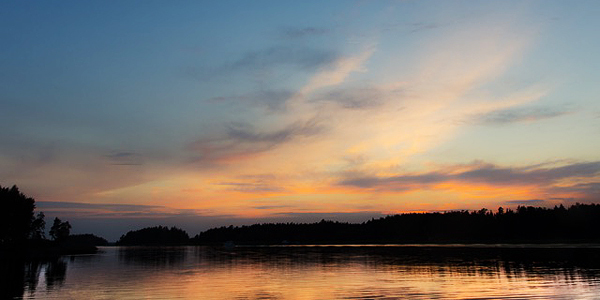 This makes for relaxing sailing and time to enjoy the fantastic and varied scenery. SiF: Thanks Tina and Richard and hope to see you soon in Finland again! 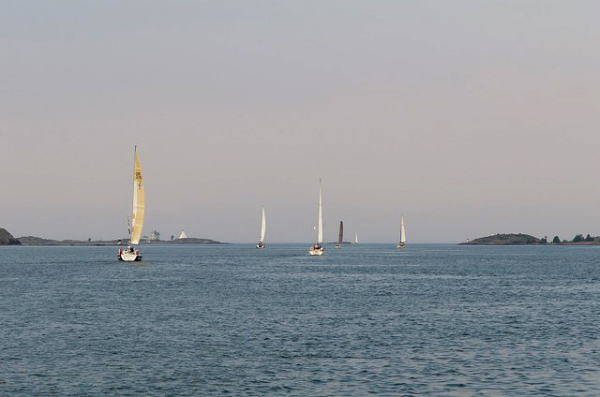 The ARC Baltic leaving Finland and the Åland islands as they head to Stockholm. All photos courtesy and copyright of Tina Exley. Thanks!